October 12, 2017 – For the past two days, advocates, community leaders, criminal justice practitioners, elected officials, researchers, among others nation-wide, have participated in the Smart on Crime Innovations Conference, hosted by the John Jay College of Criminal Justice, the Center for American Progress, and the Draper Richards Kaplan Foundation. The conference's focus was to highlight the data-driven innovations and interventions happening around the country in the criminal justice and public safety spaces, and ensuring awareness in order to promote them across cities and states in the U.S.
Presenters like Former U.S. Attorney General Eric H. Holder, Jr., Governor Nathan Deal of Georgia, New Jersey Senator Cory Booker, Vanita Gupta from The Leadership Conference on Civil and Human Rights, Nueces County District Attorney Mark Gonzalez, Manhattan District Attorney Cy Vance, Ilham Askia from Gideon's Promise, Forward Justice's Daryl Atkinson, and Glenn E. Martin from JustLeadershipUSA illustrated that the movement toward a smarter, more just, and more effective approach to criminal justice is by no means stalled. 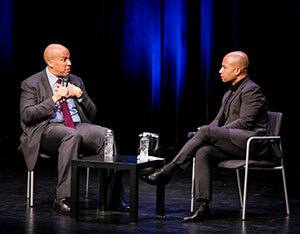 The conference, which was livestreamed, consisted of dynamic panels, keynote speeches, and armchair discussions that brought together criminal justice practitioners and individuals who have been affected by the criminal justice system, showcasing how they're developing solutions together, including alternatives to mass incarceration. Sessions included discussions around the topics of advocacy in the 21st century, justice system accountability, representing the accused, voices of the impacted community, data-informed strategies, reentry and criminal records, reducing recidivism/crime and violence, change through litigation, technology and smart on crime, tackling the opioid epidemic, the role of the prosecutor, community corrections, media and crime and justice, and a closing session about next steps. "John Jay is like a U.N. for justice issues where we bring people together -- from across the justice system and across differing perspectives -- to discuss complex issues and dissect problems using data, research, and evidence," said Karol V. Mason, president of the John Jay College for Criminal Justice. "What we share is a desire to find justice, to learn about what's working and to experiment with new things. Based on the evidence of what works, we aspire to guide policy and investments for the future. We are so proud to partner with the Center for American Progress and Draper Richards Kaplan Foundation to host the Smart on Crime Innovations conference at John Jay. We thank all our sponsors for supporting this powerful dialogue addressing criminal justice reform." For a full list of sessions and presenters, visit the Smart on Crime website. For a brief roundup of the two-day conference, click here. An international leader in educating for justice, John Jay College of Criminal Justice of the City University of New York offers a rich liberal arts and professional studies curriculum to more than 15,000 undergraduate and graduate students from more than 135 nations. In teaching, scholarship and research, the College approaches justice as an applied art and science in service to society and as an ongoing conversation about fundamental human desires for fairness, equality and the rule of law. For more information, visit www.jjay.cuny.edu and follow @JohnJayCollege on Twitter.